Looking for a quality and affordable paint for your house ? We have a proven record of accomplishment and are a reputable company in North New Jersey. We ensure that all projects are done with utmost professionalism using quality materials while offering clients the support and accessibility. For us, honesty is the only policy and we strive to complete all projects with integrity, not just with our clients, but also our suppliers and contractors. With thousands of successful projects under our belt, we are one of the most trusted painting companies in North New Jersey. 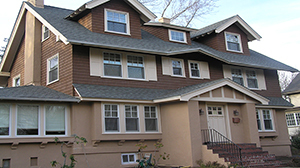 We have been painting and restoring older homes in Montclair and surrounding towns since the early 1980's. Our work philosophy known by our costumers as GIKAS WIZARD is creatively carried from project to project enhancing your home with texture, colors and details in order to comprehensively restore its charming properties.Absolute and uncompromised attention is given to the preparation of your home for painting as we will not stand the embarrassment to see your chromo symphony fall apart after a short period of time therefore our work comes with a standard warranty.